Tonight we finished the Handyman Activity Badge. Next we started the Fitness Activity Badge by completing the character connection and reading about meal planning. Home Assignment: Complete Fitness Requirements 4, 5, 6, 7. Requirement 4 asks the scouts to keep a record of their daily meals and snacks for a week and decide if they have been eating foods that are good for them. 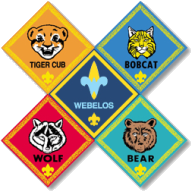 Requirements 5-7 have your scout talking to a member of their family about the effects of tobacco, alcohol, and drugs. Please have your scout prepared to bring their meal record to our next meeting for discussion.